Fr. Jeremy Paulin, OMV is the Vocation Director for the St Ignatius Province (USA) of the Oblates of the Virgin Mary. The 8th of 10 children, he was born and raised in Central Massachusetts. After graduating from Thomas More College in New Hampshire, he ran a construction company in Massachusetts and then a pilgrimage company in New York. While working on pilgrimages, he discovered his vocation to the Oblates of the Virgin Mary and entered formation in Boston in 1998. He made his perpetual profession of Vows in May 2005 and was ordained a priest at St. Peter Chanel OMV Parish, Hawaiian Gardens, California, in November 2006. 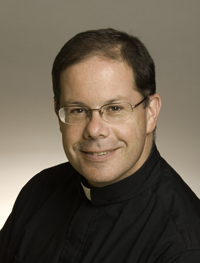 He served as associate pastor there and at Holy Ghost OMV Parish in Denver, CO., before becoming Director of Vocations for the Oblates of the Virgin Mary in 2009. When not traveling for vocation ministry, Fr. Jeremy lives at the OMV seminary in Boston.